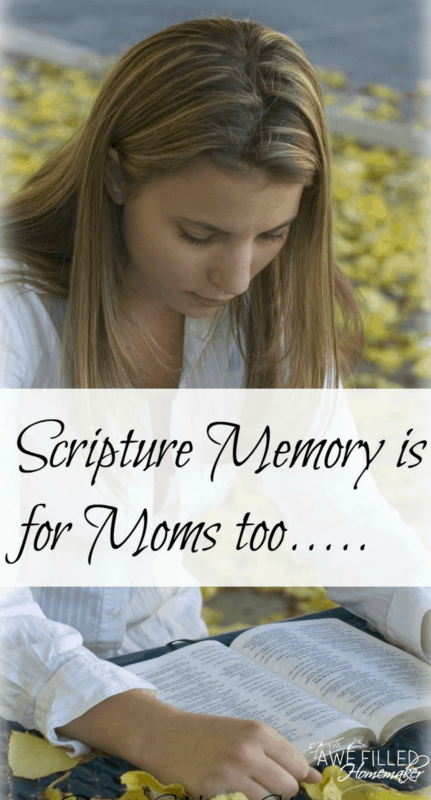 Scripture Memory is for Moms too…. It seems the majority of our day is spent hustling our kids to and from activities, commitments, church functions, recitals, camps, sports, etc, etc, etc. It seems our kids’ interests change often and we find ourselves replacing one activity for another. The hustle and bustle of our daily routines can be exhausting and overwhelming! Take my family for example. Our boys are involved in Trail Life, homeschool tutorials, sports, Bible club, AWANA, history club, science club, and the list goes on. This doesn’t even include our own daily chores such as dinner, laundry, general cleaning, doctor visits, etc. Despite the ever increasing activities as the boys grow older, one thing that I have impressed upon them from an early age is scripture memorization. Join: Journal Through the Bible on Facebook! My kids not only memorized scripture, they have flourished in it winning many awards thanks to AWANA and Bible Club. Throughout the numerous military moves, my kids always have found another AWANA club and began where they left off. They continue to ingrain God’s Word in their heart. This past year my oldest completed T&T and earned the Timothy Award. My middle son finished his first year of T&T while my youngest is a 2nd year Spark. In addition to all this, they also started Bible Club in January and caught up with the rest of the group in less than 4 months! My oldest even went on to compete at the church, district, and state level! Unfortunately, scripture memorization has become a lost art. Sure, I hear parents talking about what scriptures their kiddos have memorized, especially at AWANA or Bible Club. However, I also listen to more parents stating they haven’t the time for scripture memorization. This was something that I was taught to do as a child and is why I felt it was so important for my kids to do also. Isn’t it funny how we become convicted by our children? That’s exactly what happened to me. It occurred to me that I was no longer memorizing scripture. I was teaching it to my kids with the expectation they recite the scriptures back to me at anytime. This task has never been difficult because they truly love learning more about the Lord and His Word. It was me that had the problem. Sure, I read my Bible and study God’s Word regularly, even keeping a journal of my studies. I neglected to continue memorizing God’s Word on a regular and consistent basis in…well…years. OUCH! Talk about conviction! Join: Christian Feminine Homemaking Chat! As I reflect back, I remember all the excuses I made – to time consuming is forefront on that list of excuses. Let’s face it. I’m no spring chicken and I’m definitely not getting any younger. Having said that, age presents its own challenges. As I get older, scripture memorization takes more time and effort, not to mention consistency. Ah, yes, consistency. That word that we, as busy moms, can’t seem to grasp. Sure, we are consistent at staying busy and consistent at cleaning around in circles. We’re rushed. We are always rushed. Is that really an excuse though? Hide thy word in my heart that I might not sin against thee. It doesn’t say to only do that until you graduate high school or college or get married or have babies. There isn’t an expiration date. As I continued to think about this, I remembered the days of my youth. My best friend and I would attend multiple Vacation Bible Schools and would try our best to win the prize for memorizing all the verses. I think back to the days of church camp with my friends soaking up God’s word and making scripture memory a priority. Why did that change when I became an adult? My priorities changed to my kids, but how could I expect my children to memorize scripture if I no longer found the time to do the same. Memorizing scripture was one of the most important things I could teach them. My boys see me reading my Bible and we have our family Bible studies. They have learned that devotions and quiet time with the Lord is important because they have watched me do it. Their motivation in memorizing scriptures come from the church, Bible Club, and AWANA. But what happens later in life when they don’t have the Bible Club or AWANA to motivate them? What happens if their priorities change like mine did when they have families? Will they no longer put scripture memorization as a priority? Will the scriptures they memorize now stick or will they say, “Well, Mom didn’t make it a priority so why should I?” I will not allow that excuse to happen. Where to start? I could just open my Bible and begin to study verses. However, I go back to a previous point. We are moms. We are busy. We have carpools, activities, lunches to plan, volunteer work at schools and in the community. We have dinners to plan, house to clean, laundry – curse you laundry! I digress and return to my first question – where to start? I wanted a guide to help me ease back in. Around that time my friend, Carlie, mentioned to me that she was wrapping up another one of her fantastic books. I had no idea what the subject of the book, but as we began to discuss it, you’ll never guess the topic. If you guessed Scripture Memory, congratulations! She sent me a copy to review and I was absolutely blown away! Matters of the Heart: A 52 Week Scripture Memorization Challenge for Women was just what I needed. I found a weekly study regarding topics such as Pride, Waiting, Renewal and more. A scripture accompanies each topic. This is such a good way to either start scripture memorizing OR to get back on track like in my case. It would be totally overwhelming if I had to start out memorizing a whole chapter. 🙂 After each scripture there is a devotion that is discussed that breaks down the verse and helped me understand the verse I was learning. A weekly challenge follows that asks me to commit the verse to memory and an EASY to follow applicable task. The last thing is a notes section. Each week affords me the ability to go as slow or as quickly as I like. Physical fitness and treating our bodies like a temple are very important, but nothing is as important in our life as spiritual fitness. Using Matters of the Heart is the perfect way to start getting your spiritual life back into shape. I hope you will join me in committing to learning a scripture a week! I’m pretty sure most of my blog stems from the ways God has used my child to instruct and teach me! I bought a scripture memorization game for homeschool this year and hope we will both be able to use it to add more of God’s word onto our hearts! Love this! I’m not a mother, but I am an older sister that is involved very heavily in her siblings schooling. As they’ve learned scripture and memorized them, I’ve gotten so convicted over it, realizing that this is an area that I have failed! Thank you for encouraging Scripture memorization and for these great tips! One a week shouldn’t be too hard. Surely we can do it! I love this! How important to focus on the TRUTH!